Shimadzu has released the CLAM-2030 fully automated preparation module for LC-MS. This module automates everything from the preparation of urine, blood and other biological samples to measurement via liquid chromatography mass spectrometry (LC-MS). In only three to 8 minutes, the CLAM-2030 preparation module completes the blood sample preparatory process including the addition of reagents, mixing of the solution and the addition of a deproteinisation liquid, all of which conventionally takes 15 to 20 minutes. Furthermore, if the samples and reagents are placed and positioned in special containers for automatic conveyance to the LC-MS by an autosampler, the module can perform all of the processes automatically, on weekends and overnight. In recent years at clinical research sites the monitoring of drug concentrations in blood samples, searches for biomarkers and metabolic evaluations have become prevalent due to the arrival of LC-MS, which is capable of high-sensitivity analysis and high-speed processing. At the same time, because preparation is indispensable for blood sample analysis and the processing of infectious samples including pathogens is required, issues remain with respect to the time and workload involved in the measurement of large quantities of samples. 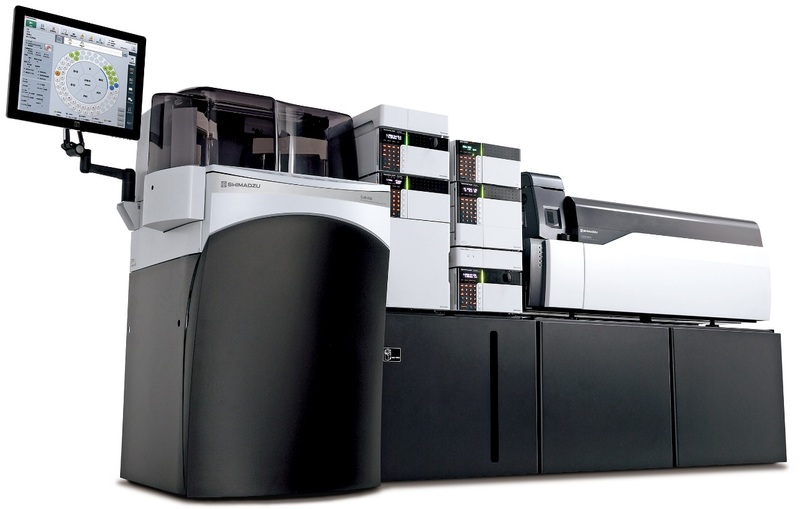 In 2015, Shimadzu released the CLAM-2000 fully automated preparation module for LCMS, a precursor to the CLAM-2030, as a means of improving the efficiency of the analysis process. In 2017, this instrument was registered as a class 1 medical device. In response to the needs of clinical research sites, the CLAM-2030 provides stable data acquisition, lower running costs and improved work efficiency. The module can be connected to four models of triple quadrupole liquid chromatograph mass spectrometers, the LCMS-8040, LCMS-8045, LCMS-8050 and LCMS-8060. Work efficiency is further improved by using it in combination with a commercial analysis kit.